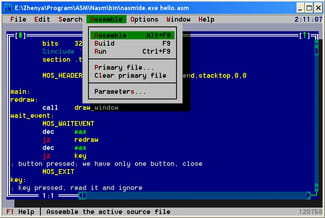 NASM, also called Netwide Assembler is a disassemble and assembler for Inter x86 architecture (for portability and modularity). This is well-known for being the most popular assemblers for Linux. The software enables to create flat binary file. Binary files contain bytes that are made to be interpreted as other than text characters. This option helps users to write boot loaders and ROM images. The project can support a wide range of formats. Here are some examples of them: Linux a.out and ELF, Portable Executable, COFF, Mach-O, Microsoft 16-bit OBJ and Win32. Apart from that, it also has its own binary format called RDOFF. It can as well support Pentium, P6, MMX, 3DNow! and SSE opcodes. This software based on the "x86 architecture" will offer users the possibility of designing IA-32, X64, AMD64, x86-64 and EM64T software. This x86 architecture is a series of computer microprocessor instruction set architectures that are based on the Intel 8086 CPU. The syntax has been designed to be easy and simple to understand. Latest update on February 3, 2015 at 11:20 AM.